Tibet is known as "the roof of the world". Situated at the center of Asia, with an area of 2.5 million square kilometers, it is east of India and Nepal, north of Bhutan and Burma, west of China and south of Turkistan. The average altitude of Tibet is 4,000 meters (13,120 feet). Historically, Tibet was divided into three general regions: Tod (upper) Ngari, Bar (middle) U-Tsang, and Med (bottom) Do-Kam. The capital city is Lhasa. Official figures put the population at six million inhabitants. Tibet was a great military power between the 6th and 8th centuries before becoming a religious nation. From that time, Tibet existed peacefully as a neutral country with little involvement in international political affairs or economic enterprises. In 1959, the Communist government of China invaded Tibet and took over the government of His Highness the 14th Dalai Lama. For the last five decades, Tibet has been ruled by China. Ngari is bordered by Ngagchu in the east, India in the west, Nepal in the south and Xingjiang (Turkistan) in the north. It covers 345,000 square kilometers, measuring 600 kms from east to west and 550 kms from north to south. There are 57 roads and paths accessing the region. The population numbers 50,000 and about 80% of these are semi-nomads. There are 254 different mineral resources: such as salt, gold and coal; 80 rivers, including the four great Asian rivers: Senge Khabab (Indus), Tachog Khabab (Brahmaputra), Langchen Khabab (Sutlej) and Maja Khabab (Karnali); and 60 lakes, including Tso-Ma-Pam (Manasarovar) and Palgon Tso. In addition, Ngari is home to the sacred Mount Kailash, Manasarovar, as well as many other spiritual and historical sites. Some Tibetan historians believe that the Shang-Shung kingdom, which had up to eighteen kings, was the original monarchy of Tibet. The official religion was Bon. The empire consisted of: Go-Phug-Bar-sum, which means Kham and Amdo, forming the Go (or gate); U and Tsang, forming the Bar (or Middle); and Tod-Ngari Korsum, forming the Phug (or Interior). The capital city of the Shang-Shung dynasty was near Mount Kailash, in Ngari. Under the government of Shang-Shung, there were sixty regions (Tib. yul kam), eighty districts (Tib. trede) and four counties (Tib. jong). In 127 B.C. the Yarlung monarchy of Tibet was established. The first king of the Yarlung dynasty of Tibet was known as Nyatri Tsenpo. A descendant of Nyatri Tsenpo built the first fort in Yarlung and lived there, making it the capital of Tibet. Bon was adopted as the official religion. In the 7th century, the 33rd king of the Yarlung dynasty, Songtsen Gyampo, built the present Potala Palace in Lhasa and moved himself into it. 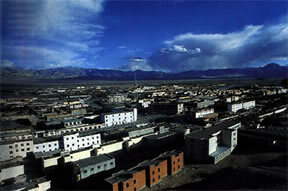 Since then, Lhasa has been the capital of the country. 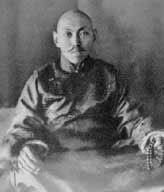 King Songtsen Gampo brought Buddhism to Tibet and, at the same time, Bon was vilified. The 42nd king, Langdharma, who was described as an evil person, was influenced by his ministers to be anti-Buddhist and pro-Bon, during his reign, Tibetan Buddhism suffered gravely. There was a religious revolution and the king was assassinated in 842 A.D. and his two sons, O' Sung and Yumdam, fought over who should succeed their father. They established two separate rural kingdoms - Yeru and Yonru - near Central Tibet. Since the death of Langdarma, nine hundred and sixty-nine years old Tibet monarchy has been ceased to continue forever. O' Sung had a son called Palkor, whose son was Kyide Nyimagon. A historical account of Ngari, "Ngari", states that during the reign of King Trisong Deshen (629-49), the 38th king of Central Tibet, war broke out between Central Tibet and Shang-Shung. As a result of the conflict, the 18th king of Shang-Shung, Sepe Gyalpo, was assassinated by enemy soldiers in the cave called Ser-phug and Ngul-phug. From then on, Shang-Shung history ceased and the Central Kingdom declared that, "everything owned by Shang-Shung was part of or included in the Central Kingdom". In Tibetan, the word "Ngari" means "part" or "belong". So "Ngari" was used to refer the new region of Central Tibet and later became the name of the region. Kyide Nyimagon was forced to escape to Purang, in Ngari, because the people rose against his authority. In Purang, he was highly-respected because the people knew that he was a direct descendant of the Tibetan monarchy. Eventually, he became the regional king of Ngari. During his lifetime, he built three forts and married the daughter of a noble family. He had three sons: Regpa Gon, the eldest; Tashi Gon, the second; and Detsug Gon, the youngest. Kyide Nyimagon installed each of his three sons as governors of the three regions of Ngari. The word Ngari Korsum was used to refer the property of the king. In Tibetan, the word "Khor" means surrounded and "Sum" means three. Tashi gon was first of king of Guge Kingdom. The kingdom had up to sixteen kings and rule over the region for seven hundred years. Guge Yaye Kor (now called Zha-Da) is situated south-west of Kailash and is surrounded by copper-coloured rocky mountains. The main historical sites are the Ruins of Guge Kingdom, and Tholing monastery. The Guge Kingdom was established by Tashi Gon in 10th century, the second of the three sons of Kyide Nyimagon. The kingdom was ruled over the region by sixteen kings in succession and lasted for 700 years. Today, the Ruin of Guge Kingdom is what we have got all about the Guge Kingdom and Tholing monastery keeps the stories about Lha Lama Yeshi-O and Lotsawa Rinchen Zangpo. They were the most outstanding members of Guge Kingdom who restored Buddhism after it had almost disappeared with the last king of the Tibetan monarchy, Langdharma. Like to learn about the ancient Tibetan civilization, Guge is one the places where you find plenty of things to see and study them. Purang Gang-ge Kor is surrounded by snow-covered mountains. It is a centre for business people, who come from all directions, as it lies on the border with Nepal and India. The main attraction of the region is Korcheg monastery, which houses one of the three most famous images of Buddha Shakyamuni in Tibet. Gongphure monastery and the sacred Kyi Tor are highly recommended to give a visit if you can. Purang is the region to find out what the farmers grow at altitude 4137 meters. Ruthog Tsoye Kor is described as "heaven on earth", because it is circled by lakes and has the most beautiful greenery in the Ngari area. Ruthog is north-west of Kailash, on the border with Lhadak, in the northern part of India. The main attractions are, Phel Gon Tso, a lake where thousands of different species of birds celebrate in summer and fishes. Lhundrup Chodeng monastery, which contains a great precious objects and holds the stories of the people. Interested in seeing the happiest Tibetan nomadic livehood, it is one of three regions to go. In the 15th century, the monarchy of the Guge Kingdom ended with the assassination of King Khridrag Pa, or Jobo Dagpo. 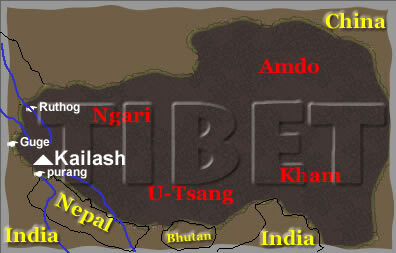 The three regions of Ngari were then occupied and ruled for 50 years by the Lhadak Kingdom, under Senge Namgyal. Lhadak also attempted to invade Central Tibet, which included Tsang and U (the centre of the country). In 1681, Gyaden Tsewang, a Mongolian, waged war on Lhadak-ruled Ngari and he won the war under guidance from the Fifth Dalai Lama. The three regions of Ngari became a part of the central government of the Dalai Lama and an administrative system was introduced. There were two Gar Pon (state governors) for the whole region of Ngari. Under their authority were four Jongs (districts) and six leaders of different villages. The state government of Ngari was known as Ngari Gar and used to be about 15 kilometers away from the present Ngari prefecture. Four districts headquarters were chosen: Purang Jong, Damkar Jong, Tserang Jong and Ruthog Jong. The governors of Ngari Gar and the governors of the four Districts were directly appointed by the central government of Tibet, sitting in Lhasa. The six leaders were given the authority to rule the remote areas of each region and their positions were hereditary. Between 1949 and 1959, the Communist Government of China took over the Government of the Dalai Lama. The People's Republic of China refers to "Tibet" as the Tibet Autonomous Region (TAR), consisting of parts of Kham, U-Tsang and Ngari, and covering 1.2 million square kilometers in area. Lhasa is the capital city. Under the TAR administration there are six Tenchu (Chinese prefectures): Shegatse, Lhokha, Nyingchi, Qamdo, Ngari and Nagchu; and seventy-six counties. Ngari Tenchu is now known as "Alli Techu" (in Chinese, Alli means Ngari and Techu means prefecture). Most Tibetans refer to Ngari Techu, or Ngari Gar. The town is situated to the north-west of Mount Kailash, 1,655 kilometers from Lhasa. Administratively, Ngari Gar is divided into seven "Shens" (Chinese counties): Purang Shen, Ruthog Shen, Guge (Zda-de) Shen, Tso-Chen Shen, Gartse Shen, Garges Shen and Tshaga Shen. The counties are further sub-divided into "Chu", (Chinese districts), Chu into Shang, (Chinese regions) and Shang into Tsun (Chinese villages). Chinese is the language used to describe these administrative divisions.